and sample some of the best seafood in the world. 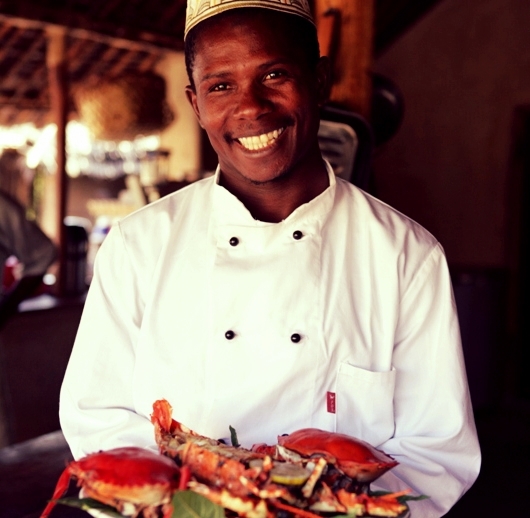 Guludo's cuisine creatively blends the very best of Mozambican and Swahili flavours with an international twist. Our supermarket is a white, tropical beach. Fishermen, farmers and entrepreneurs daily bring their produce to sell enabling us to serve some of the freshest food you'll ever taste. If you're vegetarian or have an intolerance to wheat or dairy then you needn't worry. Over the last five years we have developed an exciting and diverse menu that covers all dietary requirements. In fact, almost every guests with dietary requirement have gushed about the cuisine in our guest book! All we ask is if you let us know your requirements when you book. If you have fussy kids, then no problem. We are a small lodge and can tailor the menu around your child's wants and needs.